As I've said many, many times, cupcakes always manage to put a smile on my face. They're not the best desserts in the world by any means, but these individually wrapped packs of sweetness always do the trick for me. They put anyone near them in a light, blissful, childish mood - something most of us could use more of. I like to play around with recipes and mix and match depending on my mood of the day. These matched a lemon/chocolate type of day and the combination of both was just perfect. A tall glass of cold milk in one hand, a frosted cupcake in the other and the world is pretty much as perfect as it's ever going to be. Melt the chocolate in a double boiler, transfer to a bowl and let cool. Cream the butter with an electric mixer. Add the confectioners' sugar little by little. Mix for 3-4 minutes until the mixture is smooth. Fold in the cooled chocolate and mix until the chocolate is entirely incorporated. Ice the cupcakes as you please. Enjoy! How yummy looking and pretty!! Citrus and orange have always been a winning combo for me. These cupcakes look divine!! I think cupcakes are the perfect individual sized treat to have! Interesting combination of lemon and chocolate - would have never thought about it but it sure looks delicous - lovely picture - the first one - YUM! First of all, I love that this recipe only makes 6 cupcakes. Perfect for small households like mine! Lemon is probably my favorite flavor, so these would definitely hit the spot for me. You're killin' me. These look amazing. So pretty, and I love the lemon-chocolate combo! Cupcakes always put a smile on my face too. 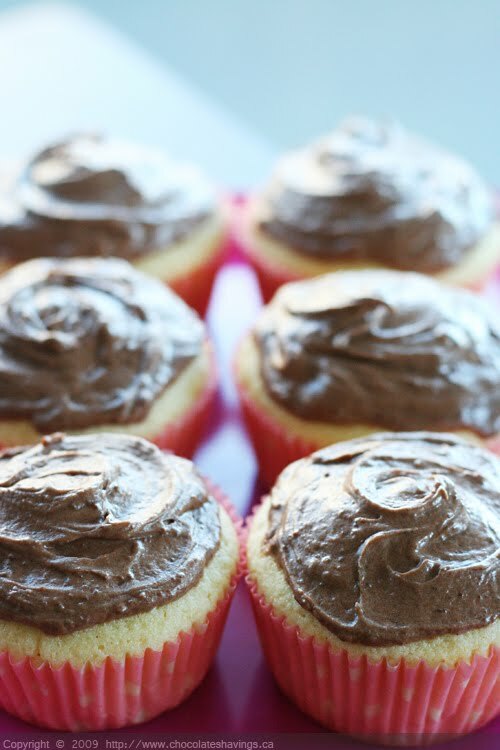 Those lemon cupcakes with chocolate icing? ... my smile wouldn't go away for weeks. Now I've been thinking for some time that lemon cupcakes with chocolate icing would be good to try - now you've convinced me! Interesting combo of lemon and chocolate! Think I'm going for the post below with salted caramel on top. Nothing is better than chocolate and caramel! i wud say that's yummmmmm! I haven't baked cupcakes in a while, and lemon flavour is my favourite one! I could do with one right now! I have to say I love chocolate and orange but have never thought of chocolate and lemon.. thought provoking recipe! It sounds great! Citrus makes cakes test so fresh! These are charmingly beautiful. I'd have never thought to put chocolate icing on lemon cupcakes. I've only seen them with vanilla icing, but these look delicious. I've never iced any of my lemon baked goods with chocolate, but I always like the way it looks and sounds. Hmm? A great sounding combination of flavors! Many thanks for this recipe. I was always hesitant about the chocolate-lemon combo until I made a lemon-chocolate marble cake and it was fantastic. I could so go for these cupcakes now! Yummy!!! !.....those cupcakes are great. I will try this one. Good job!